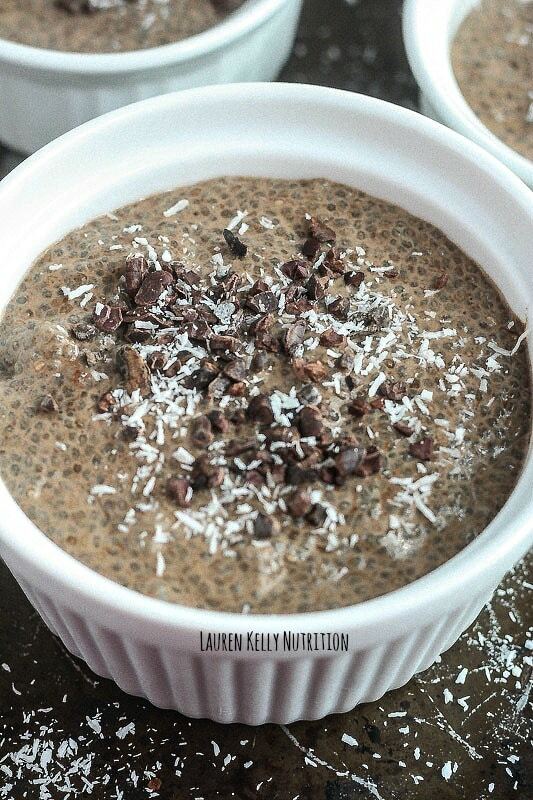 If you are looking for a healthy and not overly sweet treat, this chia pudding is just what you need! Often after dinner, I am looking for something sweet. Most nights I have some fruit but sometimes, fruit just doesn’t cut it. I want to chocolate. And lots of it. So this is when I make this pudding. 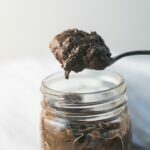 Or my Chocolate Avocado Pudding from The Everything Wheat-Free Diet Cookbook. They satisfy my chocolate cravings while being healthy at the same time. Perfection. I use raw cacao powder in this which is packed with antioxidants that help lower risk for certain diseases. This pudding is gluten-free, dairy-free and vegan too for all of you suffering with allergies or sensitivities. 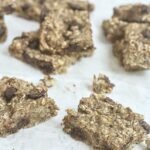 Chia seeds are also loaded with fiber, antioxidants and protein so this really is a healthy treat. When liquid is added to chia seeds, they turn into a thick, gelatinous pudding-like bowl of deliciousness. You need to try this! 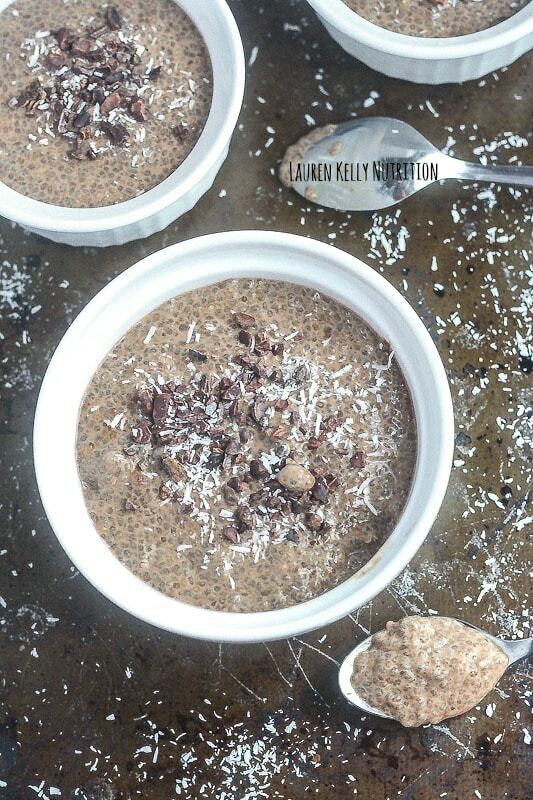 Top with cacao nibs and additional shredded coconut if desired. ENJOY! This would definitely be perfect for my sweet tooth! Sometimes only chocolate will do! This sounds so tasty for those times. YUM. This is just perfect in every way. I have to share it everywhere! I hope you like it Nettie!! Sweet and healthy are my favorite combination. I really need to try this for my insatiable sweet tooth! LOVE this! 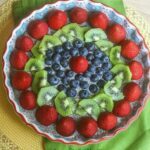 I am always looking for new chia pudding recipes! 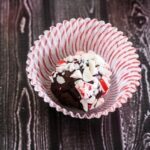 I love coconut and chocolate together! 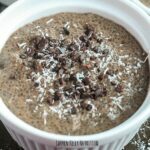 I’ve never had chia seed before, but I do love chocolate and coconut! If I ever find myself with chia seeds, I know what pudding I’m making. I still need to try chia seeds! This pudding looks heavenly! I just want to grab a big ‘ol spoon and dig in! 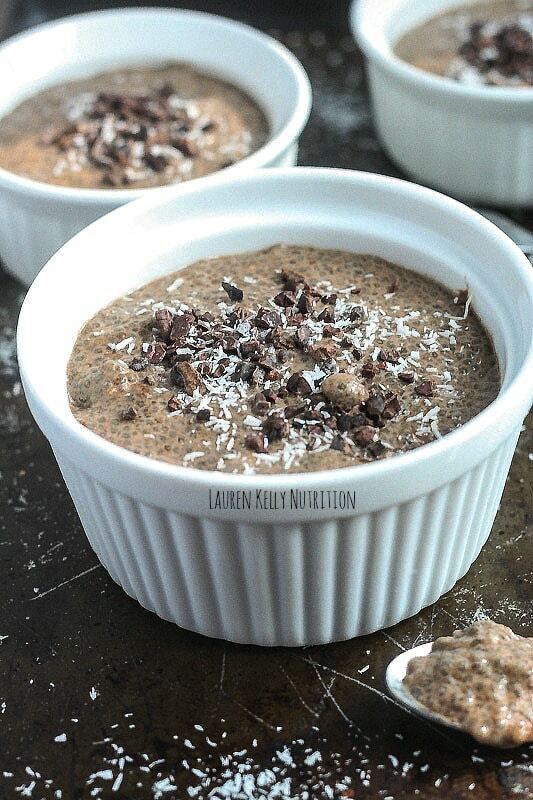 There is nothing better than a chocolate pudding packed with omega 3’s! Looks delicious! Chocolate always does it for me. ALWAYS. I need to buy some chis seeds, STAT! This looks delicious! I want some asap! One of my boys absolutely loves chia pudding! I should whip some of this up for him today!